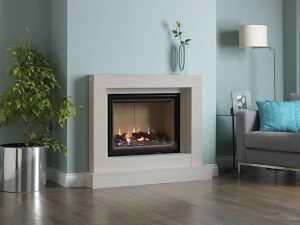 Home → Blog → What’s Best for Heating Your Home this Winter – a Fireplace or a Stove? But the question is, which of those is best? To a great extent, the possibilities rely on the current capabilities of your property – though there are certain types of fire available that are flueless and so can be fitted anywhere. However, if you’ve got an accessible chimney and flue already installed, your first step should be to make sure it’s clear of any blockages or debris and properly sealed – otherwise it’s likely to be a fire hazard and may leak smoke into the room and fail to keep heat in as well as it might. Once you know your chimney and flue are safe, you’ll find yourself with a wide range of both fireplaces and stoves to choose from. So which is the best option to provide heat for your home? Open wood fires are the image that springs to mind when you think of the festive season – crackling flames, roasting chestnuts and all. They are a great option for keeping your property snug, particularly if this is the aesthetic you have in mind. However, they are not perhaps as well insulated as other options, as their open fronts allow both heat from the fire and the wider room to escape up the chimney. Many modern fires – whether wood-burning, electric or gas – are enclosed behind glass, which already goes a long way towards preventing heat escaping from the room. There is a diverse selection of these kinds of fittings available that will tie in with both traditional and up-to-the minute interior design themes. Natural gas fires are also very environmentally friendly with minimal CO2 emissions compared to other options, so your home can be both cozy and eco-sensitive! One major benefit of fitting a stove is that you are often able to select one with an exposed pipe and only a minimal amount showing on the exterior of your house. This means that any heat escaping through the walls of the pipe on the way up will still be released into the room – so you’ll waste very little. 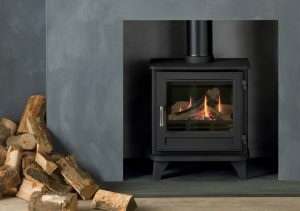 Whilst a wood burning stove may be the classic choice, you can also opt for gas or electric models, each in different, equally attractive styles. The choice will always be yours and yours alone when it comes to the fittings and features of your home, but the above should provide a straightforward guide to your options when it comes to the comparative heating efficiency of fires, fireplaces and stoves. 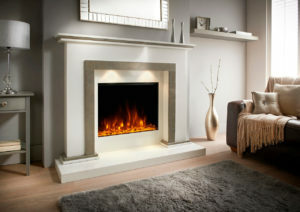 If you’re still not sure what will work best for your home, simply get in touch with the specialists at ELB Fireplaces today on 01942 607 250 or email us on enquiries@elbfireplaces.co.uk to discuss your requirements and discover what we can offer you.